The 24-Hour Mommy: Goodbye Soda, Hello Sunkist Orange Pulp! Goodbye Soda, Hello Sunkist Orange Pulp! This 2012, I decided to avoid carbonated drinks especially cola. I started having stomach cramps last year every time I drink cola and that was my signal to stop. We recently bought a juicer for our wedding anniversary and I'm in high hopes that I could also get the boys to avoid soda and choose healthy drinks instead. But of course, I wouldn't always have time to prepare fresh fruit juice. Good thing, there's the new affordable and yummy, Sunkist Orange Pulp. I remember drinking Sunkist Orange as a child. 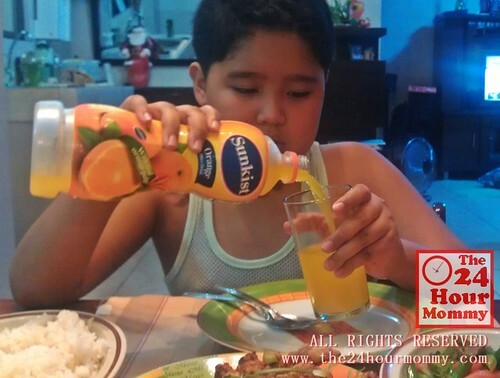 Meanwhile, Rap would always have Sunkist juices, those in triangular Tetra Paks, for his baon in school. His favorite has always been mango, though. I preferred buying Sunkist juices because they're affordable compared to other brands. But even with the low price, Sunkist juices would still taste close to fresh fruit juice. Sunkist Orange can now be enjoyed by our family anytime because it's already available in 1 liter bottles. What's even better is that it's filled with real orange pulp. I was able to nibble on some of the pulp in my mouth. I like juices with pulp, whether it's orange or mango, because it adds fiber that our body needs to get rid of wastes. My boy loved its taste. It's tangy and sweet; something that kids would definitely love drinking. I just had one glass, though, because I can't have too much juice mixed with refined sugar. I hope Sunkist Orange Pulp will have a sugar-free version for diabetics like me soon. Sunkist Orange Pulp is available supermarkets nationwide at only Php 37 for a 1 liter bottle. Follow Sunkist Orange Pulp on Facebook (http://www.facebook.com/sunkistpulp) to be updated on the latest product news and promos. i also love sunkist back when i was a little girl.now i frequently buy sunkist for my 2 year old son. it is better than giving him carbonated soda.let's choose healthy beverage. mas mura ba sya kesa sa Minute Maid? healthier than soda. sana hinde sya ganun katamid so my son can drink it. thanks for the info sis. Just have your son drink water after. Medyo matamis kasi siya for my taste but for my son it's just right. Definitely mas mura. Nasa 40+ pesos ang Minute Maid eh. We love Sunkist Orange Juice Drink, too! Yummy and healthy! I am an avid cola drinker but I have decided to live in a healthy way this year. So this year, I am planning to add Sunkist to our family's diet. This 2012, the boys will only get to drink cola outside the house. Or if they're lucky, whenever we have visitors, hahaha! Hi 24-Hour Mommy. We posted your story on our Sunkist page in appreciation. I hope you share more stories about our amazing product. Godbless.